For me, the most succesful and enjoyable chapters were actually those focussing on pure maths — such as the derivation of geometry from triangles, investigating curves created from conic sections, and the surprising complexities and subtleties of Conway's Game of Life. This is somewhat contrary to the subheading of the book "how life reflects numbers and how numbers reflect life". The best bits are those not so relevant to everyday life and are simply fascinating intellectual exercies by virtue of the way numbers and mathematics work. I believe readers likely to buy a book of this type might already find maths interesting enough, so there's no need to crowbar in the overwrought concepts of "relevance" and "everyday life"! I have to admit, however, that I approached this book with a slight amount of trepidation. Bellos made a splash in the British media in mid-April with hot news of "the world's favourite number", which seemed to me to be a rather trivial revelation. 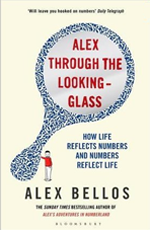 Fortunately, the psychology of numbers only takes up the first chapter and Bellos makes the case that people's selection of favourites are interesting — people tend to pick prime numbers for significant and/or mystical numbers (like 7 and 13) and as also favourites higher up (for example 31, 41, 61, 71). However, quite interesting is about as far as it goes for this section — I still struggle to find it deeply interesting, and I felt actively quite annoyed by the consultant who will invent psychological reasons for why numbers are used by brands, such as Levis 501 and WD-40. This section, for me, strayed into the realms of pseudo-science — unprovable/disprovable claims about a cherry picked dataset whose answers are already known. But despite these reservations, I did find Alex through the looking-glass a highly enjoyable read and something of a page turner! The complaints above are actually a small proportion of the overall book, so shouldn't outweigh the good in here. One final thought — it would be nice to see a related website with links for further reading and YouTube clips of the exotic Conway Games of Life that are referred to. Much of the material presented is high-level and it's a credit to Bellos that one feels like looking at a topic of interest in more detail once he's introduced it, so it would be nice to have a destination for those follow-up investigations. You can read about Sine Language, a piece he composed based on the maths of the sine wave, in a this Plus article.